Vermont Horse Country Store > Trail Riding > Laura's Loft - Kelly Full Seat Plaid Breech Limited sizes left. Going FAST! 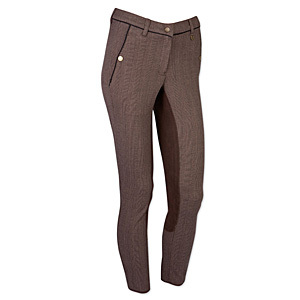 The Treadstone Kelly Full Seat breeches are the perfect blend of style, comfort and fit. Sizes are limited to the available inventory. 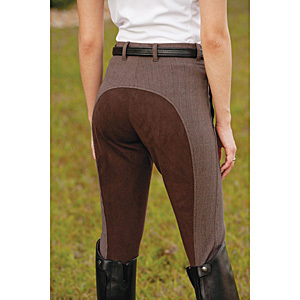 The Treadstone Kelly Full Seat Breech is a mid-rise woven breech with Nikron synthetic seat. Nikron is a technical yet durable fabric. 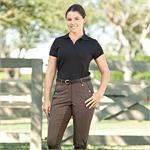 The woven Microtouch check fabric gives the breeches a soft touch and light weight feel while worn. This fabric is durable, stretchable and breathable. Front zip. Piping on the pockets highlight the check fabric. Two side pockets with snap button closures. Available in Brown plaid or Navy plaid.